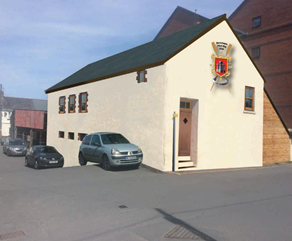 Barnstaple Pilot Gig Club has now been promised a grant of £75,000 from Sport England towards the cost of purchasing a former warehouse on Rolle’s Quay for use as a Water Sports Centre and communal facility for the people of Barnstaple. This follows on from the earlier promise by the Fullabrook Community fund to provide £34,000 as well towards the project. Both promises are conditional on BPGC raising the balance of the £200,000 purchase price for the building, and, in the case of Sport England, for the estimated £50,000 needed to refurbish. During the last twelve months the club has raised £26,000 through it’s ‘Off the R’owd’ appeal, with fund-raising events at least once every month. In addition the club is very grateful for the grants from NDC Councillors Community fund that allowed professional surveys of the building, so that plans can be made for the necessary remedial works. The Peregrine Mears Architectural practise has kindly prepared design drawings and technical drawings for the building to be used as a boatshed and communal facility, and Clear Asbestos Solutions Ltd, Slee Blackwell solicitors and Underwood Wright Chartered Surveyors have all provided professional services at little or no cost. There is still a balance of £65,000 needed to achieve the purchase price, and the club is continuing with its fund-raising efforts every month. Also the outcomes of two further grant applications are awaited. The proposed Water Sports centre has already aroused interest from North Devon Scouts, the WI, the University of the Third Age, PETROC, local Surf Life Saving clubs, Bideford Canoe Club, a Morris Dancing Group in Braunton, and West Buckland school. When complete it will have a secure boatshed and workshop on the ground floor and a substantial secure compound outside for storing trailers, boats and ancillary equipment. The first floor will be principally a large meeting area big enough to seat at least 60 people, a small kitchenette and toilets. Modifications to the building will allow disabled access.